Wintergreen essential oil smells like sweet wood, intense and slightly fruity. Wintergreen is native to the northeast region of North America and Canada, and the oil is produced in the United States. There is a form of wintergreen from the Nepal region, Gaultheria fragrantissima, that is also on the market, such as the one from doTERRA®. The plant features straight branches with shiny serrated spoon-shaped leaves. Pink-tinted urn-shaped flowers hang off of these branches, followed by crimson berries called deerberries. Inside the berry is a capsule that contains a multitude of seeds. The flowers bloom in June and July, followed by the berries in the late autumn continuing into winter. While the leaves of the plant and forest foliage often hide the light-colored flowers, the leaves and bright berries of this evergreen shine through, even in the snow. Parts of the plant are edible. The leaves have a sharp, acerbic, and astringent taste, while the berries are sweet. The berries are used in flavorings. Wintergreen is a very important plant when it comes to pharmacology. Methyl salicylate makes up to 99% of the constituents in the oil distilled from the leaves. This constituent is where we get all aspirin products. Unlike many essential oils that can be distilled straight from the plant, wintergreen leaves have to be steeped first. In the water, they undergo a fermentation process. It is only after this decomposition that the oil can develop, and then be distilled. True wintergreen comes from Gaultheria procumbens, but the pure oil is exceedingly hard to find. Common wintergreen oil is often synthetic methyl salicylate. Try to source organic oil whenever possible from a reputable distributor who you have thoroughly vetted. Birch oil, being almost identical, is a good substitute, but the same warnings must be heeded. Wintergreen essential oil blends well with peppermint (Mentha piperita), spearmint (Mentha spicata), thyme (Thymus vulgaris), oregano (Origanum vulgare), narcissus (Narcissus poeticus), ylang ylang (Cananga odorata), vanilla (Vanilla planifolia), and more. Care should be taken because the oil is an irritant, sensitizing, and is toxic. It is also a marine pollutant and environmental hazard according to Julia Lawless in The Encyclopedia of Essential Oils. Contrary to what is seen online, wintergreen oil should not be used on your pets. According to the original go-to expert on essential oils for animals, Kristen Leigh Bell, wintergreen is contraindicated for pets. Please read Holistic Aromatherapy for Animals for further information and to learn how to safely use oils on and around your furry friends. Read the full list of warnings under the facts and research section below. Commercially, wintergreen essential oil is used in some pharmaceutical and perfume applications. It's found in many creams, lotions, and hygiene products. The oil is also utilized as a flavoring in gum, toothpaste, sodas, and more. Wintergreen essential oil has a lot of controversy surrounding it, especially for home use. Many experts, including Valerie Worwood and Julia Lawless, recommend against home use for any reason. It was combined with lanolin, rubbed on the neck, and then wrapped with flannel to restore loss of voice. It was used in a blend with lard, turpentine, and opium to heal old wounds. It was mixed in a 1:8 ratio with soap liniment for lumbago. A liniment with wintergreen, aqua ammonia, and tinctures of aconite, arnica, and belladonna was used for a "weak back." Wintergreen oil was mixed with clove and lavender oil along with alcohol, chloroform, and a few other ingredients for rheumatism. It was used for all sorts of stomach upset, including diarrhea, dyspepsia, flatulence, sour stomach, heartburn, spasms, constipation, and more. The oil was made into a balm with bismuth, thymol, and vaseline to stick up the nose for catarrh. Wintergreen was also an ingredient in what was called a "Good Samaritan Liniment," that also included laudanum, hemlock, and chloroform, among others. Obviously, we do not use most of the above medicinally these days. That being said, there are uses for the oil at home if you have experience with oils and know what you are doing. It is better to educate yourself beforehand rather than learn the hard way. Remember, it is always better to be safe than sorry! Workouts can leave muscles tender and sore. The methyl salicylate in wintergreen can help combat these aches and pains. Mix the above oils together. Add 2-3 drops to a teaspoon of arnica (Arnica montana) gel and gently massage over problem areas. Mix the above oils in with one cup of Epsom salts and swish into your bath water to soothe muscles and relax the mind. Wintergreen's scent is great for overcoming unpleasant odors. Add a couple of drops to a cotton ball and place it anywhere you want to combat unpalatable scents, such as trash cans or gym bags. You can also add wintergreen oil to your diffuser for a crisp, uplifting addition to your blend. Furthermore, you can add a couple drops of wintergreen to your favorite blends for cleaning kitchen and bath surfaces to help rid them of microbes, or for your room sprays to mask unwanted scent. The oil produced from wintergreen has many health benefits. It is a mild analgesic, anti-inflammatory, and antirheumatic, making it good for pain, arthritis, and more. It is an emmenagogue, which stimulates menstruation and is a reason to not use it during pregnancy. It is also a galactogogue and stimulates breast milk flow, but the risk to the child is not worth the risk of using it in this manner. Nothing is worse than being slowed down by cold season. Nagging coughs that won't go away, congested chests and noses, sneezing—nobody has time for that. While there are other versions that create more of an ointment, this is the easiest way to make the mixture. Melt the coconut oil, add the essential oils, mix well, then let it harden again. Rub this over your chest and back. Breathe deep. You can also use just the essential oils in your diffuser to help keep the sniffles and congestion away. You can help beat the afternoon crash that often happens by carrying around a personal inhaler with wintergreen oil in it. Sniff when you feel the yawns coming on. Alternatively, you can add a drop or two to a cotton ball or napkin and keep it in a plastic bag to inhale when needed. Other than repelling certain microbes and insects, much of the research on PubMed is about oil of wintergreen poisoning. In light of this, the following information will help you use the oil safely. There are drug interactions. For instance, methyl salicylate inhibits blood clotting, so should not be used by anyone on blood thinners. This means that it also shouldn't be used by anyone undergoing surgery, or anyone with blood disorders like hemophilia. Should not be used during pregnancy, just as aspirin should not be used. This extends to not using during breastfeeding. Children should not be given wintergreen essential oil or aspirin, due to the possibility of developing a rare but serious condition known as Reye's Syndrome. No one with gastroesophageal reflux disease (GERD) should use it orally. Do not use the oil orally at all unless under the watchful eye of a physician and an aromatherapist specifically trained in the internal use of oils. Anyone with sensitivity to methyl salicylate should not use wintergreen oil. This often applies to those with attention deficit disorder (ADD) or attention deficit hyperactivity disorder (ADHD). Methyl salicylate and aspirin should also not be used in people with skin integrity issues. Tisserand also warns that wintergreen is often mixed with synthetic methyl salicylate, or that the synthetic compound is passed off as wintergreen essential oil. The oil can cause skin irritation. Always dilute with a carrier oil and do not exceed the recommended amount. Never use it on children, or even on your skin if you are pregnant or breastfeeding. People with allergies to salicylate or aspirin, those with asthma, or anyone with nasal polyps should not use the oil. Wintergreen is one of those oils that comes with so many warnings, you may just decide to stay away from it completely. Many professionals would agree with you, and if you are not experienced with oils, it is likely a good idea to go with your gut instinct. There are plenty of other safe oils that you can use. If you do choose to try using wintergreen oil, please use common sense and do not just go with whatever recipes you find online. Many of them were not created by trained aromatherapists and they can do a lot of harm. If you choose to use it, never take this oil internally, pay attention to the interactions and contraindications, and do not use more than the recommended amount. Less is always more with essential oils, and with an oil like wintergreen, that is especially true! DISCLAIMER: Momprepares.com is intended to be used for educational and informational purposes only. For safe use, please contact your medical practictioner or health care provider. Momprepares.com, its parent company, and subsidiaries does not assume liability for any actions taken after visiting these pages and does not assume liability if one misuses essential oils. These statements have not been evaluated by the Food and Drug Administration. This article is not intended to diagnose, treat, cure, or prevent disease. Mom Prepares is an essential oils and natural living blog. We bridge the gap between scientific research and the everyday essential oils user. 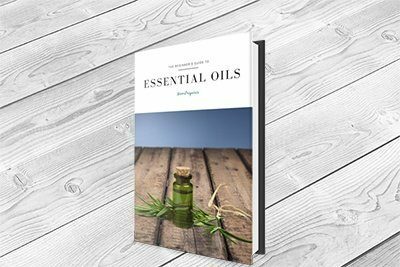 If you're new to essential oils, you can download our free eBook: The Beginner's Guide to Essential Oils.